Some of the biggest names in Nashville, including Rodney Crowell, Josh Kear, Chris DuBois, Ashley Gorley, Tommy Sims, Dave Berg, Ben Glover, Chris Stapleton, Darrell Brown, Jonathan Singleton and Jamie Moore are among the panelists participating in the ASCAP “I Create Music” EXPO. Nashville industry leaders including Fletcher Foster (Red Light Management), Kerry O’Neil (O’Neil Hagaman, PLLC), Jordan Keller, Esq., Eric Hurt (Brentwood Benson Music Publishing) and Daniel Lee (Ten Ten Music Group) are also confirmed as panelists. 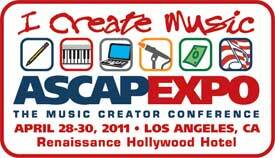 Now in its sixth year, the EXPO brings together a diverse group of songwriters, composers, producers and music industry leaders to participate in a broad range of panels designed to support music creators at every stage of their career. The three-day conference takes place April 28-30, 2011 at the Renaissance Hollywood Hotel in Los Angeles, CA. ASCAP 2008 Country Songwriter of the Year, Dave Berg, and ASCAP 2010 Christian Songwriter of the Year, Ben Glover, will join a panel including entertainment attorney Jordan Keller, Esq., manager Fletcher Foster and A&R exec Jake McKim and moderated by writer/producer Darrell Brown on The Real Nashville panel to discuss Nashville as one of the world’s greatest musical communities and hub for music creators and businesses alike. Grammy winner and ASCAP’s 2010 Country Song of the Year writer (“Need You Now”) Josh Kear, will join producer/writer Ari Levine (The Smeezingtons), songwriter/vocal producer Savan Kotecha and songwriter/producer Dan Wilson (Semisonic) on the Hitmakers panel. ASCAP’s 2009 Country Songwriter of the Year Ashley Gorley will participate in The Business of Being a Songwriter panel with Nashville business manager Kerry O’Neil, producer DJ Frank E, songwriter/producer Nicole Morier, songwriter/producer Mike Viola (The Candy Butchers) and songwriter/performer Anuhea. Hit songwriter and ASCAP 2010 Country Publisher of the Year’ Sea Gayle Music partner Chris DuBois will join the Two Sides of the Coin: Music Publishing – Side 2, “The Independents” panel along with publishing execs Justin Kalifowitz, Sam Kling, Barbara Vander Linde and Tom DeSavia. Other highlights will include singer/songwriter Fergie of The Black Eyed Peas, who will join the We Create Music panel to discuss how to forge a lasting career; singer/songwriter Sara Bareilles interviewing music legend Lindsey Buckingham; and Desmond Child’s Master Class in Songwriting offered to 60 randomly selected attendees. For an updated list of panelists, performances and additional information, click here.